Six buses are set on fire by unidentified militants. BEIRUT — Evacuation efforts in Syria were on the verge of fresh collapse Sunday, with thousands of people trapped inside the shattered rebel enclave of Aleppo after gunmen burned a rescue convoy bound for government areas in a neighboring province. The Britain-based Syrian Observatory for Human Rights said evacuations were postponed for an “unknown” period, deepening abject suffering inside eastern Aleppo as the United Nations thrashed out ways to resolve the crisis. After more than three hours of closed consultations at the U.N. Security Council, France and Russia said Sunday that they had agreed on a resolution to deploy international monitors to eastern Aleppo to ensure safe evacuations and immediate delivery of humanitarian aid. Negotiations to revive a complicated exit deal for civilians and fighters in Aleppo have broken down repeatedly since forces loyal to Syrian President Bashar al-Assad forced the rebels’ effective surrender there last week. 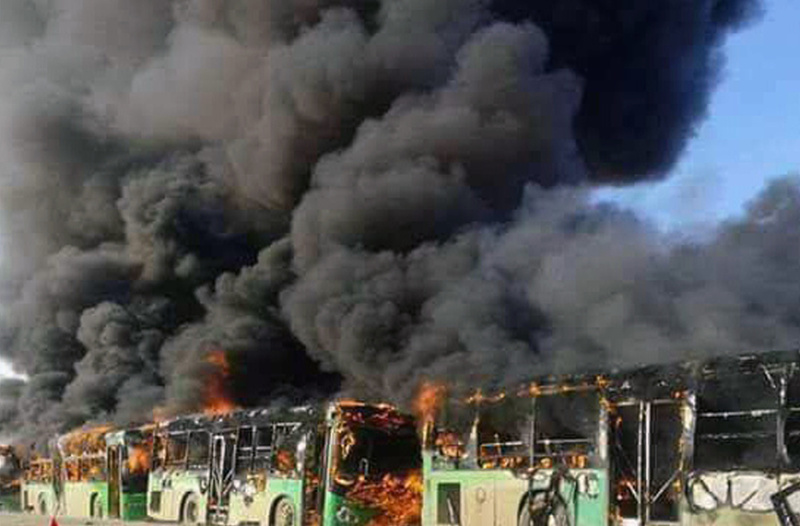 And Sunday, hours after the International Committee of the Red Cross said it was hopeful evacuations could finally resume, a fresh hurdle struck: Video footage from the northwestern province of Idlib showed smoke and fire billowing from a convoy of repurposed school buses bound for Fouaa and Kefraya, besieged villages that have taken on great symbolic importance to Syrian President Bashar al-Assad and his Iranian backers. Tehran has demanded that the area be evacuated as part of a broader deal that will allow thousands of people to leave what remains of the rebel-held eastern areas of Aleppo, an enclave where conditions are so desperate that aid workers said this week that they had seen nothing comparable in all their years of humanitarian efforts. “You pigs are here to help Shiites. You won’t leave alive,” a man is heard saying off camera in one of the video clips. Although the identity of the attackers was not clear, reports suggested they had the backing of Jabhat Fatah al-Sham, an al-QaIda-linked Sunni group with significant influence in Idlib. “Cowardly terrorist attack on civilian buses & killing driver must not end evacuations,” Jan Egeland, a humanitarian adviser to the United Nations, said Sunday in a tweet. But inside the rebel enclave, residents said it brought further misery, with thousands awaiting evacuation in freezing temperatures as night fell. The enclave has been reduced to a pinprick of territory after government forces swept in earlier this month, backed by heavy bombing raids. The compromise between Russia and France offers hope to the beleaguered residents of eastern Aleppo, many of whom are wary of leaving the area unless international observers monitor the evacuations. On Friday, a bus carrying hundreds of evacuees was held up by pro-government militia fighters who were later accused of ordering dozens of people off the bus and then stripping, robbing and reportedly even killing several among the group.